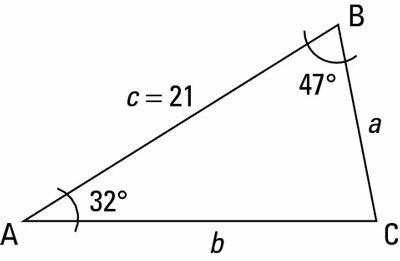 If you know two angle measures and a side length on a triangle, you can use the Law of Sines to find the missing parts of the triangle. In this case, you need to know either two angles and the side in between them (angle-side-angle, or ASA), or two angles and a consecutive side (angle-angle-side, or AAS). Whenever you’re given two angles, you can find the third one immediately and work from there. 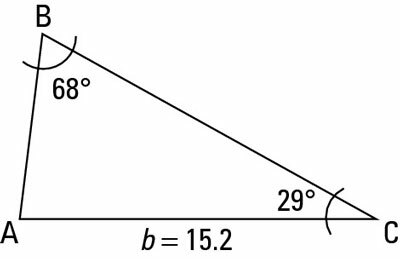 In both of these cases, you can find exactly one solution for the triangle in question. This figure has all the given and unknown parts labeled for you. Determine the measure of the third angle. Set up the Law of Sines formula, filling in what you know. Set one fraction with an unknown numerator and the fraction with a known numerator equal to each other and cross multiply. Find the decimal approximation of the missing side using your calculator. Repeat Steps 3 and 4 to solve for the other missing side. State all the parts of the triangle as your final answer. This check is a good way to verify whether a triangle is an example of AAS. Set one fraction with an unknown numerator and the fraction with a known numerator equal to each other and then cross multiply. Solve for the missing side.